﻿ Motorhome Seatbelts - Time to belt up? Motorhome seat belts: Time to belt up…? Seat belts in motorhomes is a controversial topic. But it needn’t be. It’s time for some common sense. 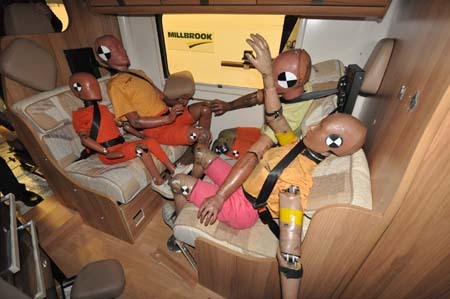 Who’d have thought the subject of seat belts in motorhomes could raise so many questions? Plain and simple, if you want to offer your family the safest way to travel, make sure you buy a motorhome that’s fit for the purpose. Vehicle safety has come a long way since the first seat belt law was announced back in 1965. And it wasn’t until 1983 that the wearing of seat belts (if fitted) in front seats was made compulsory. Then, in 1991 it became law to wear rear belts (again, if fitted). Put simply, if seat belts are fitted you should wear them. If they’re not fitted and you choose to carry passengers, that’s reckless to say the least. The question of adding extra seat belts to existing designs is a bit more complex. But, there’s a simple argument – if the original design did not incorporate belts, there’s strong reason to say they shouldn’t be added. Even if mounting points are accessible, there’s every chance the rest of the conversion didn’t take into account the adding of belts. For example, a basic seat base with no metal framework will simply collapse in a crash. Proper upper body/head restraints are essential, too. Other fittings need to be considered – for example locker doors with positive catches will always be safer in the event of an accident, and stowing loose items such as sink covers etc before travelling. Remember, also, some legislation could be affected by future cases in the courts of law. At present, the UK’s Construction and Use Regulations stipulate that the driver of any vehicle is responsible for making sure anything carried on board, including passengers, are not subjected to any dangers whilst being transported. The other critical issue that people tend to forget is, if you fill your vehicle with passengers, there’s a possibility of overloading it… which could lead to prosecution under Construction and Use legislation and make your insurance void. Our advice will always be that the safety of your passengers is paramount. 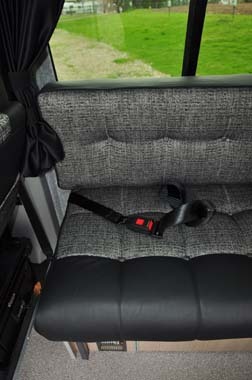 *Motorhomes registered on or after October 20, 2007, must have seatbelts for forward and rearward facing travel seats. These seats must be badged to indicate they are designated travel seats. See the Direct.gov website for more seat belt information. 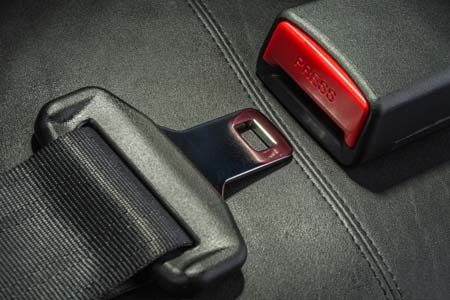 * Seatbelt fittings are also assessed as part of the MoT test. Can I add seat belts to my motorhome? It’s not recommended by industry experts. And simple commonsense can explain why. In many instances, if original conversions weren’t designed for additional passengers it’s not a good idea to think they can be easily adapted to do so. Put simply, older motorhomes may have forward-facing seats without any kind of restraint. But, they will not have been designed for the retrofitting of seat belts. Even if specialist fixing points are provided in the base vehicle, do note that the seat bases themselves, as well as other aspects of the conversion work, will not have taken into account the adding of additional restraints. He adds, the NCC’s own Product Approval Scheme for new motorhomes would only look for the Type Approval of the vehicle and does not inspect seat belts individually. Can lap restraints be fitted to side-facing rear seats? Type Approval comes to the fore here. But, there is an anomaly. Individual Vehicle Type Approval allows the fitting of lap restraints to side-facing seats, whereas Whole Vehicles Type Approval does not. Your doctor may say you don’t have to wear a seat belt, on medical grounds. If that’s the case, he/she will give you a Certificate of Exemption from Compulsory Seat Belt Wearing, which you must keep in your vehicle. You will also need to show it to police if you’re stopped. My motorhome has six sleeping berths but only four designated travel seats. Why is this? There is no legislation to say you must have as many seat belts as beds. Indeed, many manufacturers prefer to offer some flexibility when it comes to sleeping. Elddis is different, operating a “belts = berths” policy for all its motorhomes. See also our previous report. I have a bought a swivel seat for my iveco daily but can only fit it rear facing ,due to handbrake and gear level it wont swivel if in the front, is this legal ,the seat belt is attached to the seat as it is a twin seat. Two seatbelts means two people can travel. The vehicle will show on DVLA record as driver plus passenger. For more information, we’d suggest contacting the DVSA. We are looking at a 2013 Holiday rambler Ambassador 36 ft. The couch behind the driver has been changed to a same width reclining seats couch. They are side facing. Would the RV have factory anchor bolts or would there be none? If not can they be added keeping in mind this couch is part of a slide that moves outward. Any solutions to this situation? Thank you! You would need to speak to the dealer selling this vehicle. Seat belts aren’t recommended for anyone sitting sideways. Hello well I am confused by all the comments. I`m not sure I need seat belts or lap belts or any at all ? I have a Ford Pollensa Autosleeper 2008 with 2 seat belts fitted for driver and passenger front seats only. I may have 2 children or adults wanting to be in the side facing seats in rear. No seat belts there. Should they be wearing belts? Seat or lap? Hi Angela, you can’t carry passengers on side facing seats. so many comments to absorb here so here’s one more ! my June 2007 2 berth motorhome has 2 side long bench seats – question – who can i take in my van as there are no belts etc fitted ? It’s not advisable for anyone to travel in the bench seats if there are no seat belts fitted. The vehicle is restricted to the driver and front seat passenger only. I have a fiat authorial mohican 4 berth 1999. Only two belts. Sure facing seats in back. Any recommendations on how I could add two belts please?. Hi Ricky, seat belts aren’t recommended for anyone sitting sideways. Also, check your motorhome’s V5 document because it might only be rated as a driver and passenger vehicle for insurance purposes. Just to be clear on seatbelt laws: (this is set in stone and not advisory) although people “may” tell you not to carry passengers in the rear for safety issues..
You CAN carry up to 16 passengers on your normal car driving license providing. 1) it’s not for hire or reward 2) the vehicle is under 7.5 tons GVW 3) all seats are sideways on. The way to carry passenger in your camper or mobile home “legally” is keep any passengers on either sideways seating (which seat belts are not required due to it being deemed belts cause more harm!) or it is legal to not have belts on 45 degree or less seating! Simple resolve is don’t have side or rear facing seating if you want to carry anyone. Safety of passengers will always of course be paramount – and whilst ‘older’ vehicles will not be subject to some legislation it’s still advisable to make sure all passengers – including pets – are secured in a vehicle when travelling. I am a coach builder in the sense I’ve converted 27 ex council welfare buses (3.9 kg’s on average ULW) and was the 1st in the UK to do this back in 2003. Anyway, I’ve turned a 4.2kg trip axle Renault Master Tvac wheelchair access bus into a rather nice camper home incorporating a living area behind the driver and an 8ft square double bedroom at the rear. There is a wall now behind the driver with an access door on the passenger side SO I can’t have a passenger seat as it will impede access. I have a long horseshoe suite on the driver’s side which has a side facing section of around 1400mm (PSV regs state 410mm is the seating required for 1 passenger) so I can have 3 passengers as I see it without belts!? Also 45 degree seating or less is exempt from seatbelt by law! As I see it this “could” carry up to 8 passengers (poss 16 but not that I’d need to) without any legislation so long as there was all side facing seats. I’m only looking to take the wife and 3 cats out as it happens. I’ve looked on the net and spoke to 3 police station traffic officers and they haven’t a clue which is weird considering they wouldn’t recognise this offence! Any views here!? Hi my 2005 class A motorhome captain seat only have lap belts. Can I replace them with integrated seats. I can only assume that these are ‘travelling’ seats as in a 2005 motor vehicle the driver and front seat passenger seats would have been fitted with three point belt systems. Changing the seats from lap to three point will of course mean that the forces that act when the seat is put under strain during braking change as well. If the seats have ‘integrated’ three point systems – then, before installation, the strength of the floor mounting would need to be considered to make sure that this was sufficient to manage such a loading. If the ‘three point system’ was seeking to allow for the belt to be secured to a pillar of the motorhome, again the strength of the pillar would have to be investigated to make sure that this could manage sufficient loading. Of course this change of seats / restraints is a substantial change to the factory supplied version of the vehicle, and in order to ensure compliance with the terms of any insurance the keeper would need to notify the changes – otherwise they could invalidate their insurance cover. An insurer may request an inspection by a suitably qualified engineer to confirm that the alteration meets their requirements. I have a 12 year old Autotrail there are only 2 seatbelts in the front but I want to take my granddaughter with us as it is a 4 birth, after reading the comments I am still not sure about the law. If you do not have seatbelts fitted in the rear seats then you are not able to carry extra passengers. 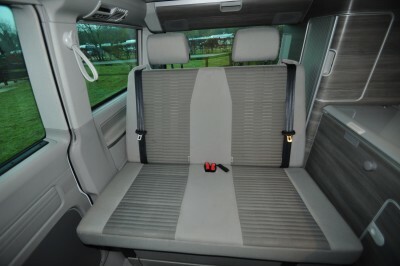 My talbot t berth campervan has 2 forward and 2 rear facing seats with not seat belts. Could just pull out the forward facing seats completely and bolt in a double bus seat unit with 3 point belts? Hi James, any seat must be robust enough to support the loadings that may be exerted onto it by the seatbelts and ‘their’ restrained passengers. This load then transfers to the floor / chassis of the vehicle – which must also be capable of managing any load that is exerted onto this. These loads are substantial and prior to any installation we would suggest that checks are made with a competent engineer to establish that these loadings would be within the vehicle’s capabilities. This ‘adaptation’ should also be advised to the relevant insurance company. Our 1989 Autosleeper had lab belts on 2 forward facing rear seats. We had seatbeltsevices design and fit frames with 3 point inertia belts. Children now can come with us, they are safe, we didn’t have to change vans. The internal use is not compromised. Expensive perhaps at about £1400 but worth it. Some of comments on here are too negative, generalised and ill informed. we have a campervan and want to take my son out in it. it only has a lap belt so was going to put his seat in the front passenger side but are we allowed to travel with said seat facing rear. Hi side facing is not recommended. can anyone tell me if under 16 can travel in a motorhome if they have bench type seating . is this legal ? Hi Stuart, it depends on whether the bench seats are sideways / forward or rear facing. If the bench seats are forward or rearward facing and are ‘designated’ as travel seats and no seat belts are fitted or there’s just a two point system then they cannot be used by a child. Children must always be secured using a three point belt system. It’s also not the safest practice for adults to be carried in a sideways seat with lap belts. I have a small dog a JRT should she have some sort of restraint when traveling and what is the law on this. Hi Dorian. In the interests of everyone’s safety all passengers / pets / goods should be secured when travelling in a vehicle to protect them all from risk of injury or damage. I have a 2001 motor home. It has 2 front facing travel seats with seat belts. Am I right in assuming the 2 rear facing seats are not to be used as they do not have seat belts? Yes you’re right. The safety of your passengers is paramount. This is why when paying a large sum of money for a motorhome you need to research what use it is going to get and for how many people and passengers. Why buy a seven berth auto trail with only 2 travel seats. Oops typo. He didn’t grow a seat he grew out of it. lap restraints on sideways seats are a tricky one, it depends on the nature of collision, they can help reduce injury or they can result in injury, Back in the day before school minibuses all had forward facing seats we were advised not to fit lapbelts to the two benches at the back which were sideways facing. I believe that the fit of a lapbelt is also fairly critical, if it can rise up the abdomen there is risk of internal organ damage by the belt. I looked into this subject when buying our 1992 Talbot Express Autosleeper Harmony. It came factory fitted with 2 forward facing single seats with lap belts (better than nothing) on the rear seats which also convert to double side facing seats and 3 point inertia reel belts fitted to the front driver and passenger seats. If there were no belts fitted it would be in theory ok to use the rear side facing seats without belts due to its age but a very grey area in the eyes of the law, and you would need to speak with your insurance company to see if you are covered. As for retro fitting lap belts to side facing it was not recommended due to the extreme stess’s that would be put on the body in an accident, it could actually be more harmful than not wearing a belt at all. When it comes to children and seat belts the law is readily available on the Internet, the only comment I will make make on this is from personal experience. When our 2 year old out grew a child seat with 5 point harness, uk seats only take children up to 18kgs after that it’s booster seat with 3 point belt. To keep within the law we found a seat supplied from a specialist child car seat company in Milton Keynes which is usable with 5 point harness up to 25kgs and because it’s European standard certified ok to use in the UK. It also has the advantage of being safe to use with lap belts up to18kgs. Why is it that only the positive statistics of wearing seat belts are published? As a former Police Officer for 30 years I Know that people have died because they were wearing a seat belt, while others are still alive because they were not wearing a seat belt when they had an accident. Given freedom of choice, I would not wears belt. We looked at fitting rear belts to our Romahome R20. Retro fting rear 3 point belts was going to ruin the interior if done safely, the engineering to ensure they were safe was massive. So we didn’t do it. Really helpful information, no one will usually advise you. I would like to know more about lap restraint bets for side view rear seats. I have a 16 yr old autosleeper. It has three seat belts for the forward viewing seats.